Background: A series of (E)-5-(4-((Z)-4-substitutedbenzylidene-2-thienylmethylene-5-oxo- 2-phenyl-4,5-dihydro-1H-imidazol-1-yl) benzylidene)thiazolidine-2,4-diones were synthesized and evaluated for antimycobacterial and antimicrobial activity. All these ligands were docked against protein (InhA) Enoyl-ACP reductase of the type II fatty acid syntase (FAS-II) system, (PDB ID: 4COD). Objective: In this report, we have designed and synthesized azole scaffolds with good antitubercular activities as there is a real need to develop new candidates with less toxicity and more efficiency toward pathogen. 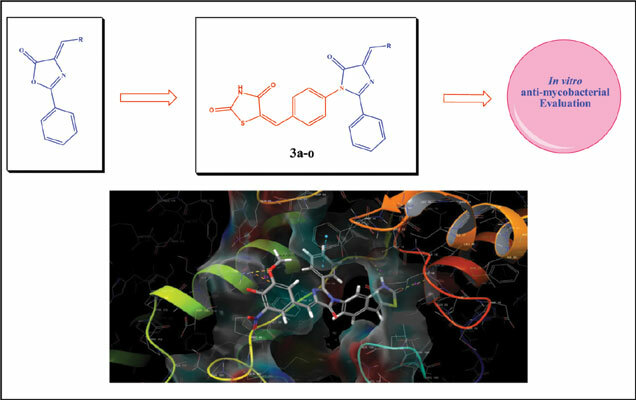 The obtained antimycobacterial activity data have been validated in the terms of ligand-protein interaction and were also analyzed for ADME properties to determine their potential to build up as good oral drug candidates. Methods: All the synthesized compounds have been established by elemental analysis, IR, 1H NMR, 13C NMR and Mass spectral data. In vitro antimycobacterial activity was carried out against (M. tuberculosis) H37Rv strain using Lowenstein-Jensen medium and antimicrobial activity against two gram-positive bacteria (S. aureus, S. pyogenes), two gram-negative bacteria (E. coli, P. aeruginosa) and three fungal species (C. albicans, A. niger, A. clavatus) using the broth microdilution method. In silico molecular docking studies were carried out using Glide (grid-based ligand docking) program incorporated in the Schrödinger molecular modeling package by Maestro 11.0 and ADME properties of synthesized compounds was performed using DruLito software. Results: Compounds 3a, 3b, 3d, 3g, 3i and 3n exhibited promising antimicrobial activity whereas compound 3n showed very good antimycobacterial activity along with Gilde docking score (-8.864) and with the one violation in Lipinski's rule of five. Conclusion: The wet lab result for compound 3n along with Glide XP docking score and the calculated ADME parameters give the best choice for the preparation of new derivatives in order to improve antitubercular activity in future with more improved potency. Keywords: Imidazolone, thiazolidionedione, antimycobacterial activity, antimicrobial activity, molecular docking, Lipinski`s rule. Keywords:Imidazolone, thiazolidionedione, antimycobacterial activity, antimicrobial activity, molecular docking, Lipinski`s rule. Abstract:Background: A series of (E)-5-(4-((Z)-4-substitutedbenzylidene-2-thienylmethylene-5-oxo- 2-phenyl-4,5-dihydro-1H-imidazol-1-yl) benzylidene)thiazolidine-2,4-diones were synthesized and evaluated for antimycobacterial and antimicrobial activity. All these ligands were docked against protein (InhA) Enoyl-ACP reductase of the type II fatty acid syntase (FAS-II) system, (PDB ID: 4COD).